What’s Next for LGBTQ People of Color? 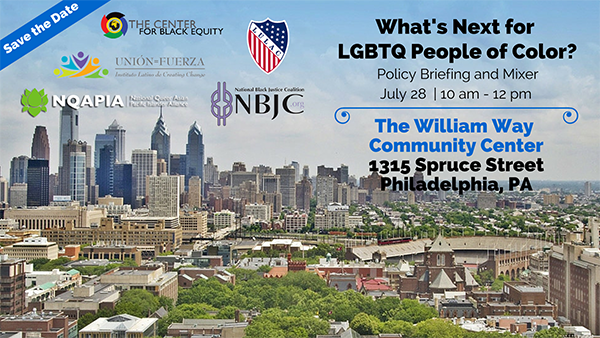 Join the Center for Black Equity, League of United Latin American Citizens (LULAC), National Black Justice Coalition (NBJC), NQAPIA, and the Unión=Fuerza Latino Institute on Thursday, July 28 from 10:00 a.m. to 12:00 p.m. for a policy briefing in Philadelphia, Pennsylvania. Aisha C. Moodie-Mills, President and CEO of the Victory Fund, will moderate a dynamic panel that will address priority issues for LGBTQ People of Color. Stay after the briefing to enjoy a mixer for the panelists and guests. https://www.nqapia.org/wpp/wp-content/uploads/2016/07/LGBT-POC-DNC-Briefing.png 225 400 NQAPIA https://www.nqapia.org/wpp/wp-content/uploads/2016/06/Logo_NQAPIA_and_Tagline_Web-Ver2.jpg NQAPIA2016-07-25 17:17:192016-09-14 19:28:08What's Next for LGBTQ People of Color?